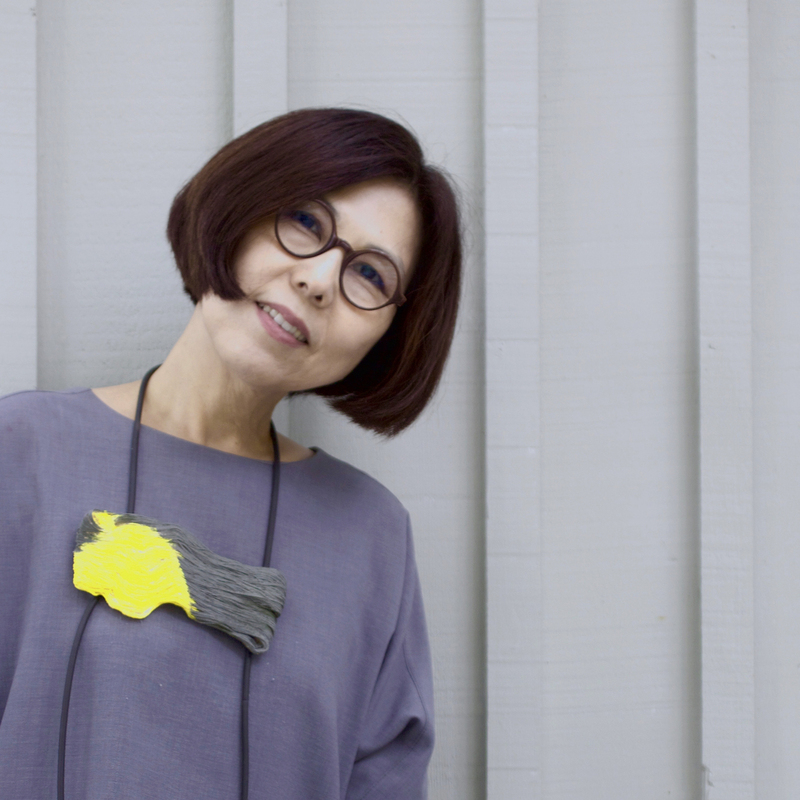 Myung Urso is a contemporary jewellery artist living and working in the USA. Her intuitive and spontaneous creative process leads her work to become both painterly and sculptural at once. Myung’s aesthetic enhances the innate textures of materials. The beauty of imperfection, simplicity and spontaneity that she inherited from Korean culture are strongly applied to her art in how she works in a playful manner with uneven and irregular shapes. I dreamed and challenged myself rather than rebelled in order to expand my own native Korean traditional boundaries to become a more abled woman/person. Following my dream, I studied abroad and travelled to experience many different cultures. I achieved quite a lot as a young woman. Since I settled down where I live in Rochester, NY, USA, with my husband, three dogs and two cats, I am quite content with my surroundings. I now follow through what I see within myself as an artist. No. I do not need to be. I believe in myself to have further potential ability to express through art. Yes, I do. I love wearing my large sized necklaces and brooches when I dress up. I also use my own ceramic pieces in our kitchen, which are unusually shaped and textured. It is quite fun to put food in my own plates or bowls during our daily dining experience. Yes, I think so. We eat food with our mouths though eyes arise an apatite for food. Beauty is as important as function for dishware. As I make one of a kind jewellery pieces, the dishware also contains my character or artistic taste. The idea for my Steinbeisser pieces is based on my recent solo exhibition titled ‘Trans-Form’. The main materials for it were recycled paper berry baskets, which have functional slit holes that are reflected in the series of dishware. For Steinbeisser I used paper clay. I recently learned hand building clay work. These two clays have similar characters and qualities in many ways. With both clays I added sand for texture from Lake Ontario near where I live. I applied natural dye color from gardenia, beet, aronia powder and some food safe dye for paper clay pieces. For my jewellery, I use mainly organic materials such as textiles or paper, which I acquire from Korea. I am now working on a contemporary jewellery exhibition with broken Chinese ceramic pieces that I was offered to select from a private collection, this show will be touring internationally for the next few years. I also work on sewing and soldering in my studio on a daily base, as well as continuing experimental clay work. I love mornings as a new day with new sun, new air and new sky after a restful sleep in my own bed. I am also always excited to see new ideas appear and to explore them in my studio the next day. What has been your favorite dinner experience? My favorite dinner experiences are more about the atmosphere than the food itself. When I travel I look for simple and fresh local food. I remember travelling with my sister to the San Francisco bay area many years ago. We ended up in a small beautiful local restaurant, just the two of us there while it was so dark and pouring rain outside. The French chef came out and served his food directly to us and we chatted for long hours while tasting Napa Valley wine. It is a very special memory. With my husband, we travelled to Sicily some years ago and made spaghetti from fresh ingredients with Sicilian wine which we got from a farmers market. It had such a fantastic taste that it stayed forever in our memory. We always try to make it again in the same way at home but it never turns out to be as good as the time back in Sicily. Above all, my most favorite dinner should be the one with my mom who recently passed away. We often had snail soup, which is a specialty local food in my hometown. She loved eating this soup her entire lifetime and I know now that I will never sit together and share the soup with her again. I am not sure what makes an artist successful but I wish to make work that I can be proud of. What are you 3 favorite pieces on Jouw…? I like Joo Hyung Park’s Moment Plates which are well crafted with a sense of humor, Maki Okamoto’s Double Spoon made from a simple idea and very graceful, and Rebecca Deans’ Soil Plates which are just made from raw nature material with a texture that is so beautiful and unique.